It’s been a long time coming, but our public art / seating project in partnership with Adam Zombory-Moldovan of ZMMA Architects at the Rickyard has now been installed. It’s located on the new Persimmon Homes development to the east of Shaftesbury in Dorset. We really enjoy working with Adam and the team at ZMMA, it’s a very dynamic and creative partnership which is also currently finding expression in the form of furniture for two high-profile museum projects – at the V&A in London and the Watts Gallery near Guildford. You can read more about these in the Best of 2015 Workshop Round-Up. 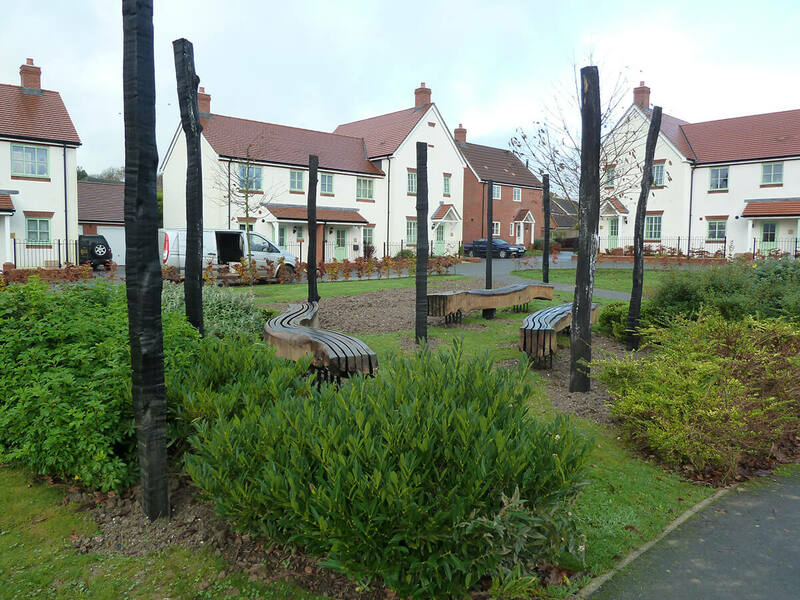 The Rickyard was originally born out of a 2011 public art project for the centre of Shaftesbury which fell away, luckily we were able to use many of the ideas, research and development from there to create this installation. 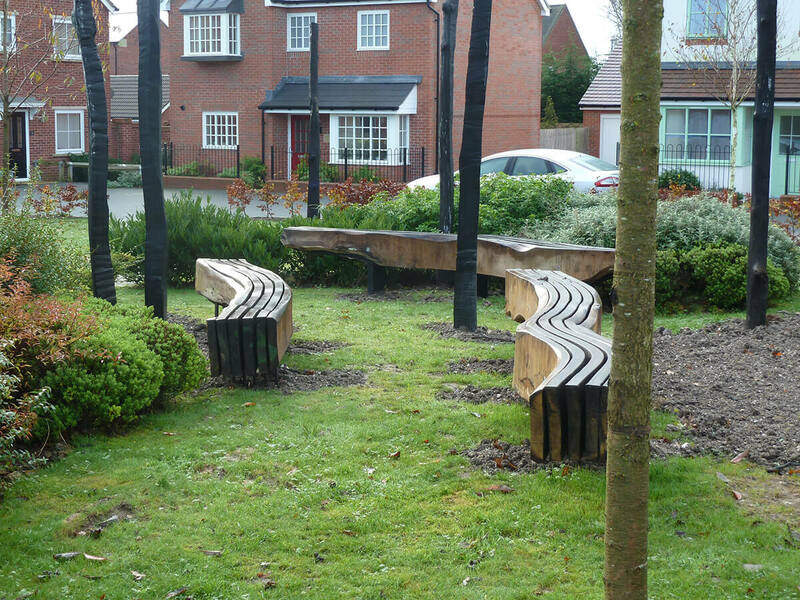 It’s taken over 4 years from concept to completion, with the curved log benches and uprights having been stored in my yard for the last 2 years! We know anything to do with public sites, planning and development takes an age, and we have got used to a variety of projects moving through the workshop schedule at very different speeds. However, 4 years+ is probably the record so far! There is still work to do, with a new pathway through the benches and uprights being laid before the site is complete, but you get a good idea of what it will look like now. 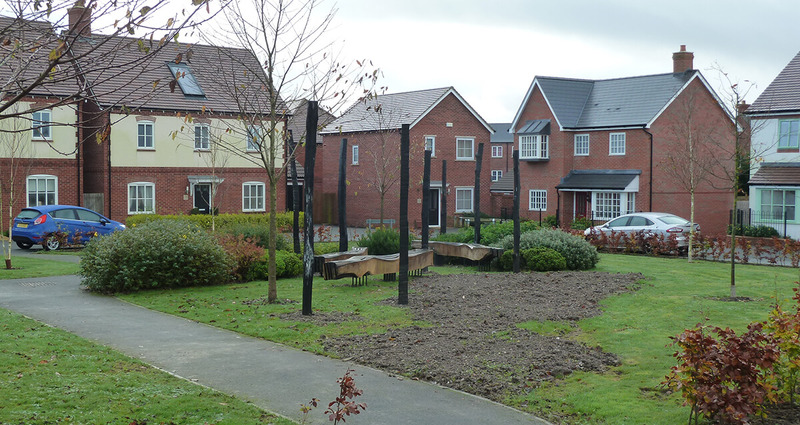 The installation sits in the centre of a green space surrounded by newly built homes. Although it’s hard to tell at first glance, a public footpath runs through the square from corner to corner across the diagonal. The benches and scorched oak uprights provide both a sight-line through and a visual focus in the middle of this modern square. This part of North Dorset is a landscape full of ancient places and pathways, before the houses were built many were visible from the Rickyard, so perhaps this is our way to link the old world with the new. There will be a full design case study once final images are taken and the works are complete – watch this blog. In the meantime you can read more about The Rickyard and the other Shaftesbury public art projects by clicking here. After 4 years in the development and design process the ZMMA / STP ‘Rickyard’ project has finally been installed on site. Just some pathway work and landscaping to complete now.